Stuck for dinner? 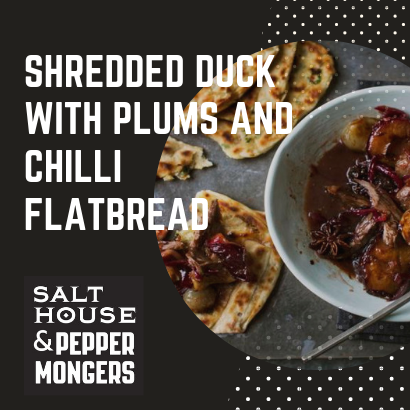 Try Salthhouse & Peppermongers Shredded duck with plums and chilli flatbread. 2. For the shredded duck, place the duck in a roasting tin and season generously with Salthouse & Peppermongers Bali Baby Kechil salt and Tellicherry black pepper. Add the shallots and roast for 30 minutes. 4. Meanwhile, heat the oil in a large frying pan over a medium heat. Add the red onions and fry for 5-6 minutes, or until they begin to caramelise. Sprinkle over the grated ginger. 5. Add the cloves, star anise, redcurrant jelly and prunes to the onion mixture and continue to cook gently for 10 minutes. Turn the heat off and set the chutney aside; reheat when the duck is cooked. 6. While the duck is still cooking, make the flatbreads. In a bowl, mix the plain flour, yeast, Bali Finishing Salt and warm water until the mixture comes together as a soft dough. Turn the dough out onto a lightly floured work surface and knead lightly until smooth. Roll the dough into a ball and place in a clean bowl. Cover with a clean tea towel and set aside to prove for 20 minutes. 7. Grind the garlic, chillies and salt in a Himalayan Salt pestle and mortar along with the olive oil. Add the butter and chopped parsley and mix well. 8. Cut the dough into 6 equal-sized pieces. Roll each piece out onto a lightly floured work surface to a 30cm/12in square. Spread each flatbread with some of the butter mixture. 9. Fold the flatbread from left to middle then right to the very left so that it ends up one-third of its original width. Then fold each flatbread from bottom to middle and top to very bottom so that it ends up one-third of its original height. Roll each flatbread out to the thickness of a pound coin. 10. When the duck is cooked, pull the meat from the duck carcass and lightly shred it using tongs and a fork. Stir the shredded duck meat into the chutney. Stir in the roasted shallots. Remove the stones from the softened plums and add the flesh to the chutney. 11. Dry-fry each flatbread in a frying pan over a high heat for 1-2 minutes on each side, or until light golden-brown on both sides. 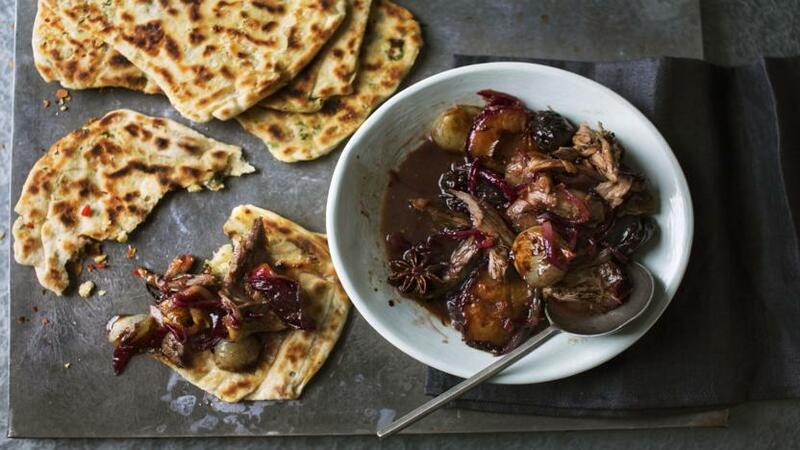 Serve alongside the warm shredded duck and Salthouse & Peppermongers Bali Baby Kechil salt.